Sometimes our dreams come true in a slightly different way than what we have expected or hoped for… but the important thing is to understand that there is no way to happiness – happiness is the way! 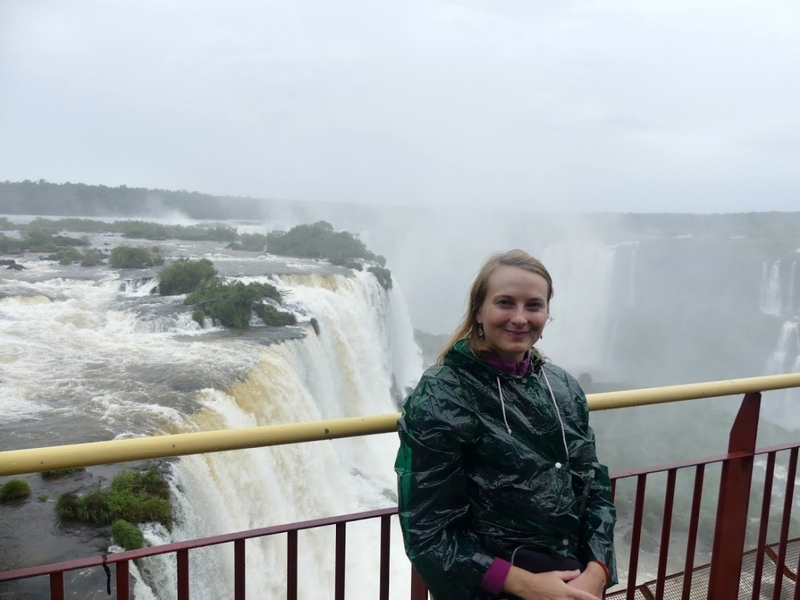 So, my full appreciation for another of my dreams coming true… though there was no sunshine and thus no rainbow over the Falls of Iguazu, though it was raining hard and I hiked through the National park in Brazilian flip flops, with a Czech raincoat on, most of the times not able to take out my camera due to the heavy rain, I loved the whole experience in its seeming imperfection… just for what it was! 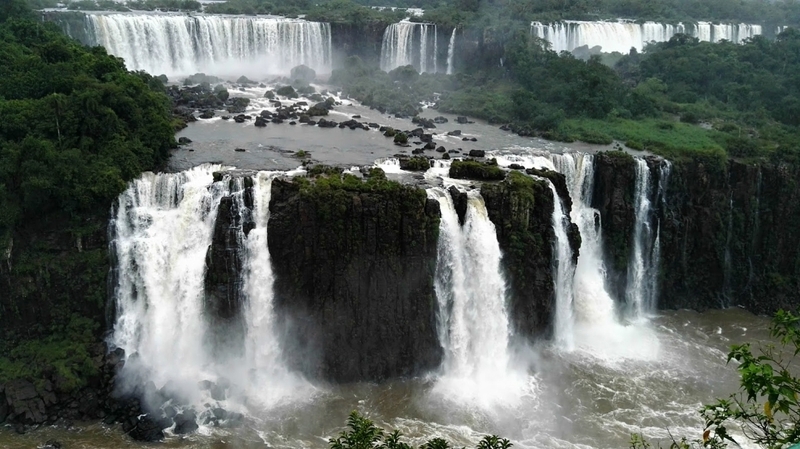 The unique complex of waterfalls was created when an enormous volcanic eruption created a huge crack in the earth some 132 million years ago and formed around 275 natural cascades. 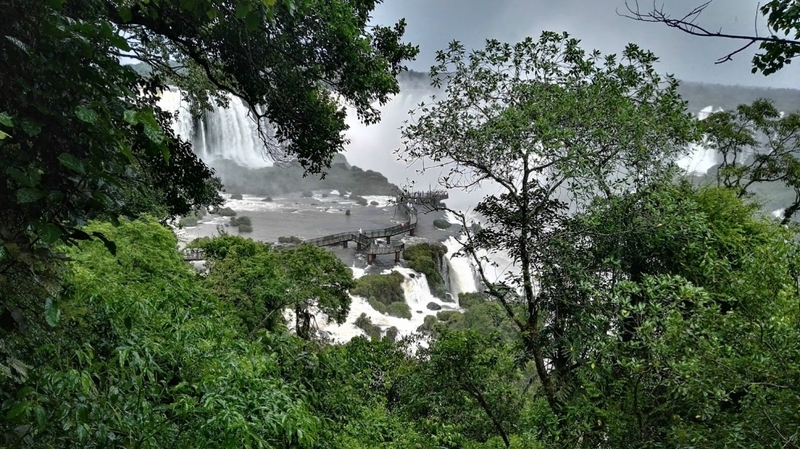 At a cost of 70 Reals per person I got to see the beautiful wonder (one of the world´s seven natural ones) with two companions, Giovani, a teacher from Univel, and his wife Silvana. 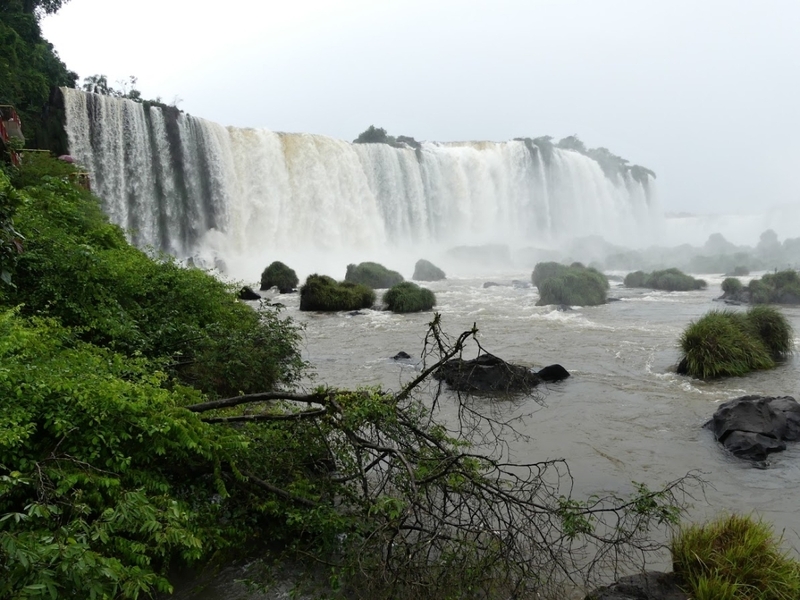 The drive from Cascavel to the parking lot by the National park took us about two hours – in the heavy rain. 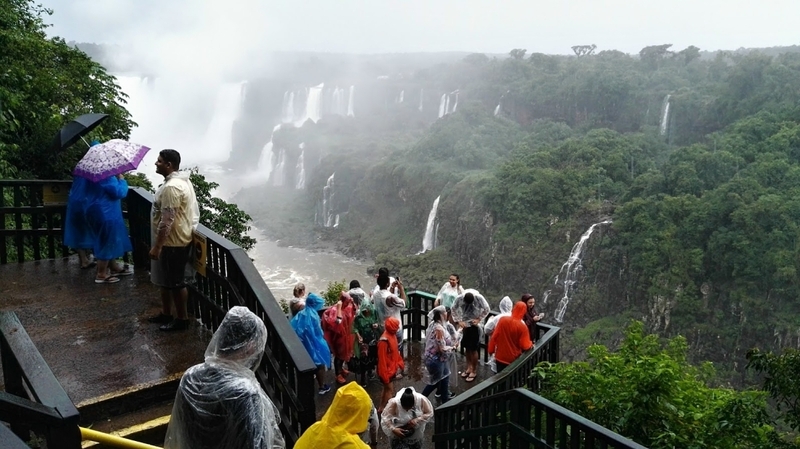 The Falls annually receive more than 2 million tourists, being recognized worldwide for its beauty. 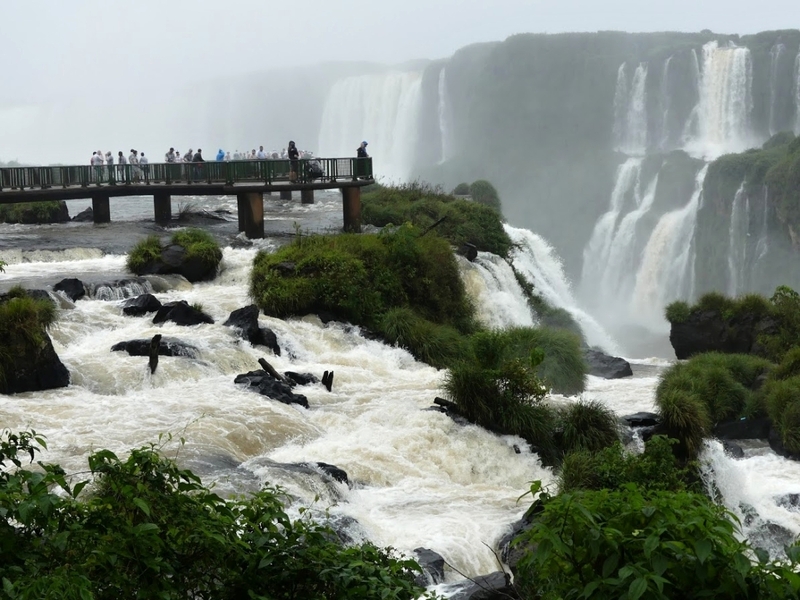 Located within the Iguazu National Park, on the border between Brazil and Argentina (in the cities of Foz do Iguaçu and Puerto Iguazú), the falls make up the largest waterfall system in the world and divide the river of the same name into the upper and lower Iguazu. 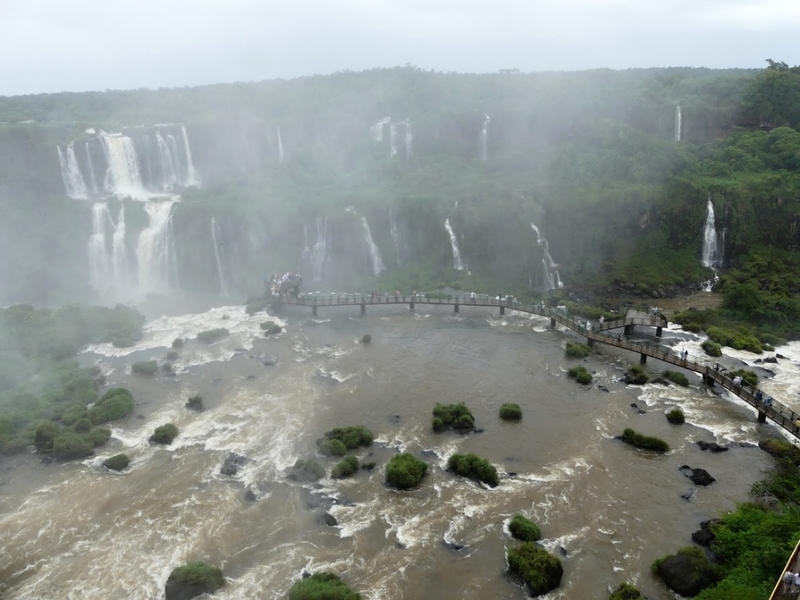 It is an important tributary of the Paraná River which forms a natural border between Brazil, Argentina and Paraguay. 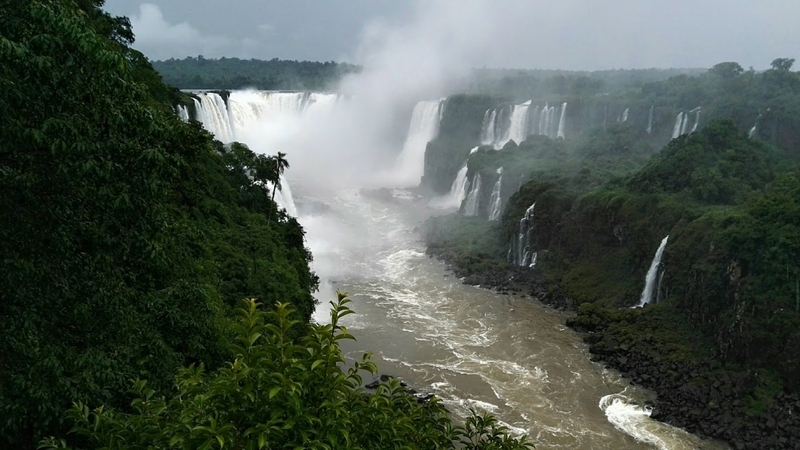 Iguazu literally means “big water” and the highest drop reaches 82 metres. 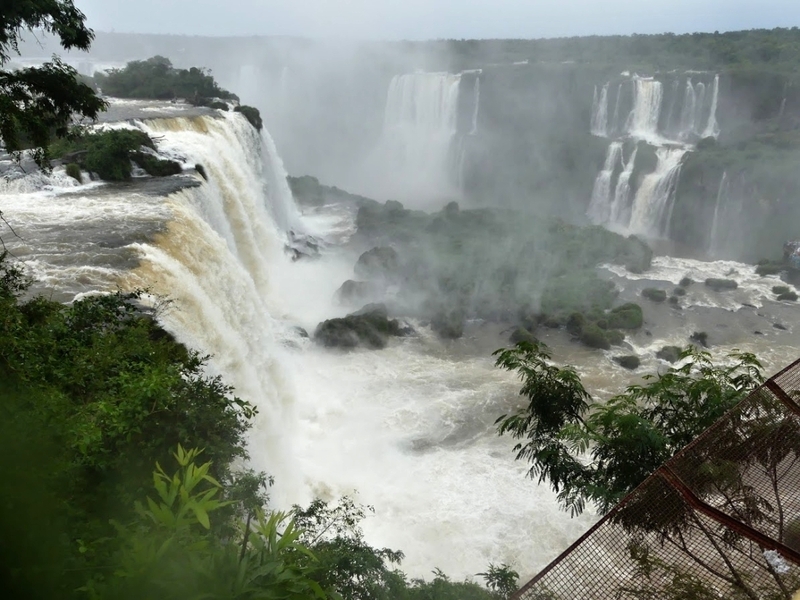 A staggering flow rate average of 62,000 cubic feet of water flow over the edge, every single second. 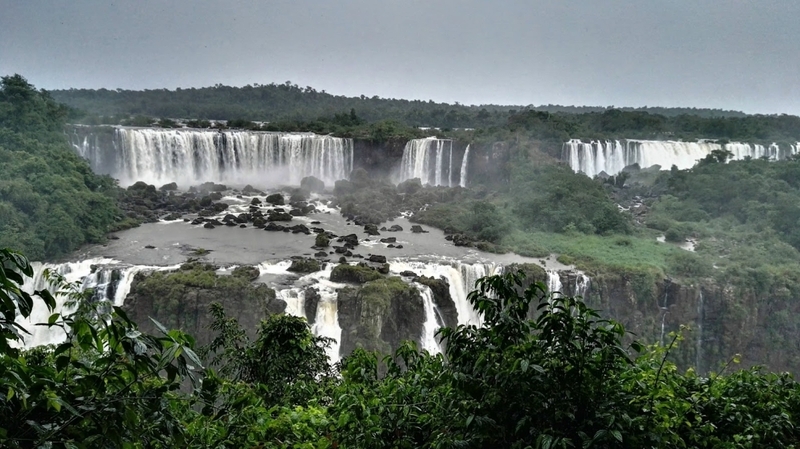 Some tourists opt for seeing the Falls from both sides, Brazilian and Argentinian, but I was more interested in seeing the Brazilian side, which was what I did. The National park is ready to welcome tourists and unlike e.g. Brazilian airlines offers guiding comments on the bus (which takes the tourists through the park to the trails that run along the river to the Falls) in English too, not just Portuguese. So you learn that you are not supposed to wander off the trails, that you can do a lot of fun activities in the park and on the river (as long as you are willing to pay extra for them), such as e.g. 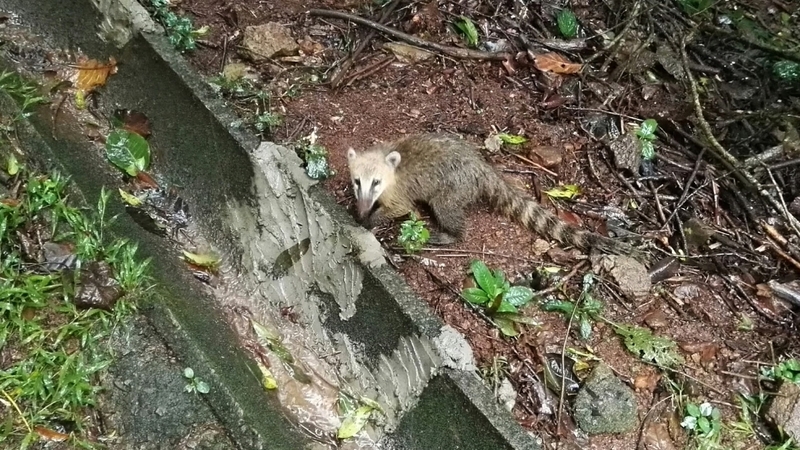 rafting, and that you are not to feed the animals in the park – and you do get to see many cute raccoons that look at you like you might be having something good for them so it is hard to resist that cute look. On the Brazilian side, the tour lasts for circa three hours, starting with the bus ride (leaving the Visitors Centre). The trail as such runs through the woods, with open spaces for observation of the Iguazu Falls out of which the best one is definitely the platform leading to the Devil´s Throat – you are basically a few metres away from the Falls, coming towards you on one side, and continuing underneath you into a massive plunge on the other side. 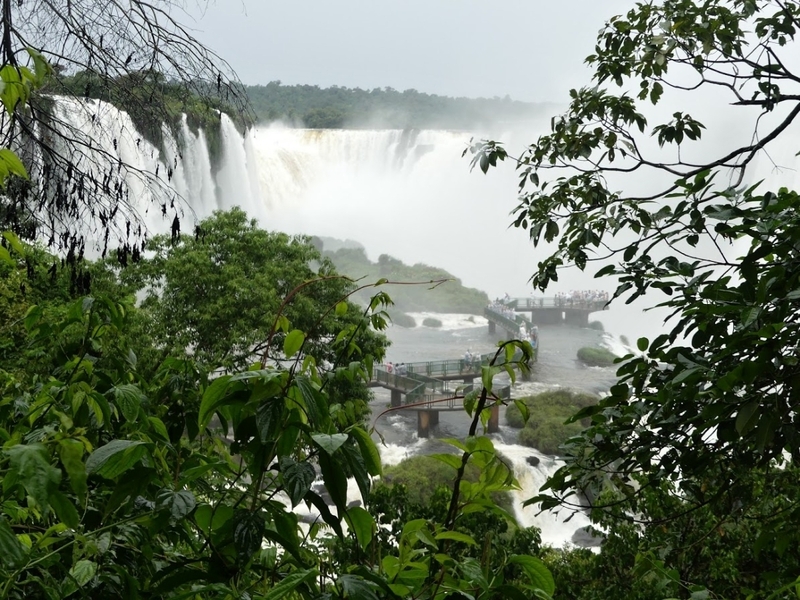 The trail is concluded by an observation tower, a memorial for Alberto Santos Dumont, and a food court. After the hike (which is in most parts accessible to wheelchairs) the bus takes you back to main Visitors Centre. 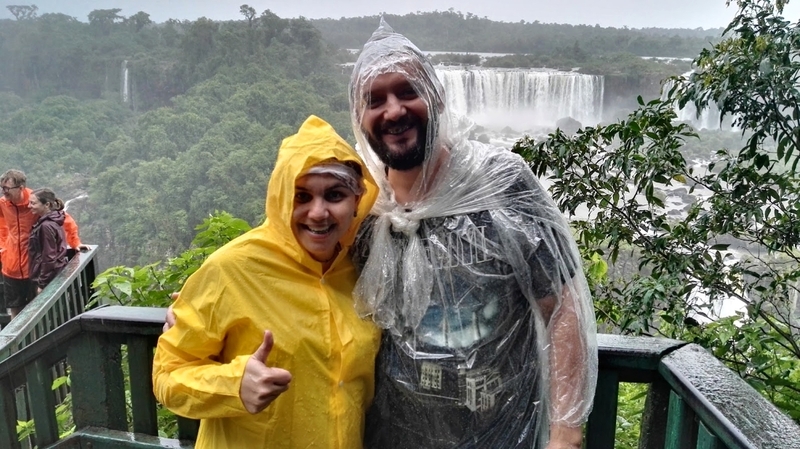 There are many additional activities you can do in the park (if you want a really unique experience, know that there is a helicopter ride available above the Falls), so best, if you´re interested, is to check the webpage of the Falls for the list and prices of these. Popular among locals as well as tourists is the Bird Park sanctuary where you can see several native exotic birds (including macaws, golden parakeets, harpy eagles, and toucans) flying freely in their natural habitat of a subtropical forest. 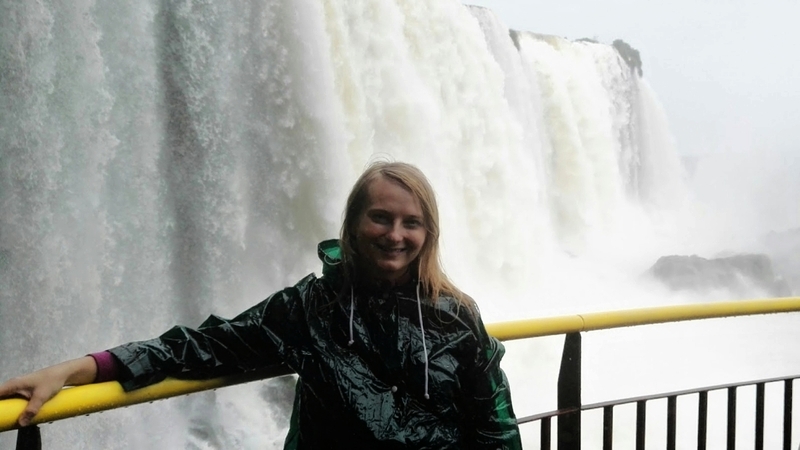 I have seen Niagara Falls some years ago, on a lovely and warm sunny day, with all the rainbows and such. 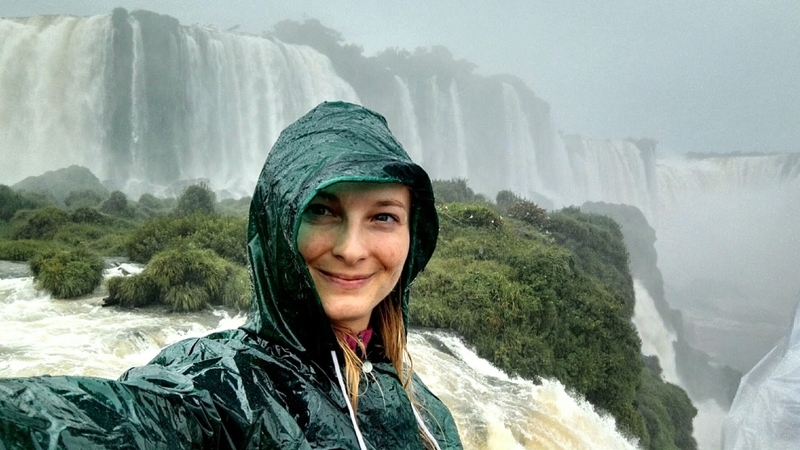 But truly, compared to Iguazu, they somehow lose the glam. 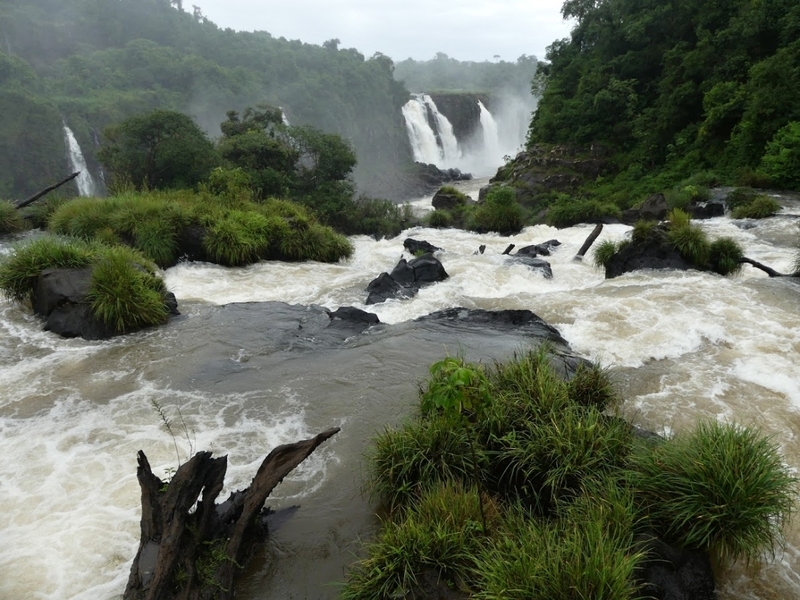 When you plan your trip to the Falls it is convenient to save up a few hours for the shopping in Paraguay. 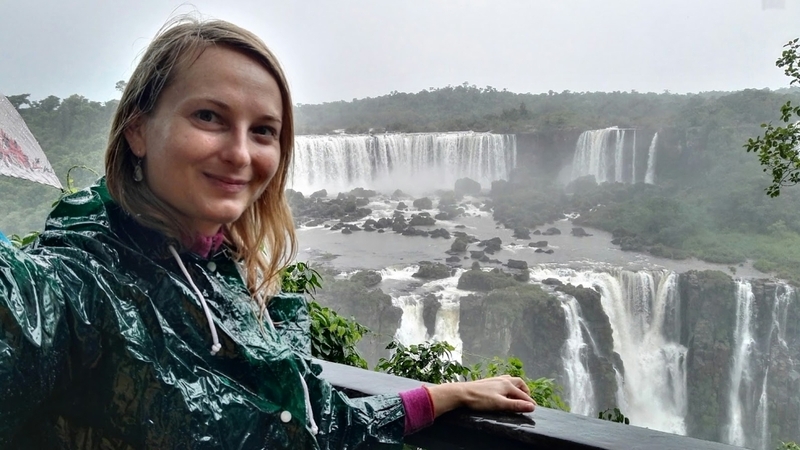 The country is much cheaper than Brazil or Argentina and the locals of Foz do Iguaçu are frequent visitors to the popular Basan Shopping Mall in the tax-free Paraguayan city of Ciudad del Este. You can browse a wide range of stores, including fashion boutiques, perfumeries, souvenir shops, and electronic gadgets – all of which are available at attractive, tax-free prices. The city of Cascavel where I was living and teaching was named after rattle snakes that used to occur commonly in the area. Nowadays, it is rare to see any. The same is true for mate, dried and ground leaves of a species of the holly genus with the botanical name Ilex paraguariensis (yerba mate), a sacred plant of the South-American Indians called Guaraní. The plant contains about two percent of caffeine, tannins, theophylline, essential oils, vitamins A, B and C and other beneficial substances. The decoction of the leaves has strengthening effects on the nervous system, eliminates fatigue, is used to boost immunity and its antioxidant effects slow down aging. It is also an excellent means of detoxifying the body, suppressing the feeling of hunger and thus being a suitable supplement in reducing diets, promoting digestion and having diuretic effects. Yerba mate used to be widely grown on the plantations around Cascavel, but – once again – this is no longer true. It is much more common for certain areas in Paraguay and Argentina nowadays and honestly, younger Brazilian population would not even be interested in drinking this magic potion. It is rather the elderly who you can still see sipping their “mati” (decoction) from the huge “matero” (the container). While there are certain traditions broken today, there are other “local and special” phenomena still gaining in popularity: those would – of course – include football (soccer) and music. Out of football, the household names and living legends would include Pelé, Zico, Rivaldo, Ronaldo, Ronaldinho, Romário, Garrincha, and others; out of music, it would be the renowned bosanova and samba song singers and song-writers, among others Tom Jobim and João Gilberto and his daughter Bebel Gilberto (yes, the one whose song you can hear in Eat, Pray, Love when the character of Javier Bardem nearly accidentally kills that of Julia Roberts). And – as a fun fact: I was told that Chapada dos Guimarães, a beautiful natural area filled with crystal clear water holes and amazing mountains (do not confuse with Chapada Diamantine which is elsewhere), is the area where “modern” New Age hippies would gather in belief that the extra-terrestrials are interested in this location and tend to send their exploring UFO´s there! Seriously, check out Google and see how many people claim having seen a UFO in this territory! I don’t like airports. You barely get any proper meal (like rice or soups or something else that was actually cooked and is healthy) – at best you generally (leave out the huge world-renowned airports for now please) get some snacks such as pastries and hydrocarb-based bready stuff like pizzas or quiches and baguettes, the waiting seems long and is very uncomfortable, the aircon is frequently too strong and here in Brazil – on top of that all – barely anyone speaks English and the Wi-Fi does not work most of the times. Waiting for my connecting flight to Rio in Curitiba, I experienced two worst airport-gastro moments in my life: a 25-real-worth salad which would be perfectly fine if only it weren´t buried in litres of industrial lime-flavoured mayo which made it sour and inedible (Brazilians love their salads “seasoned” this way), and a 10.50-real-worth tea-bag which tasted like old socks and was dumped into a tiny weeny espresso cup! I know that Brazil is more popular for its coffee, but come on! Tea in an espresso cup? And the stale taste proving that the tea was most probably out-of-date?